Gawd I love coffee. Strong black and bittersweet, coffee gets me going and keeps me there. At my house the six cup stove-top espresso maker (the lower portion pictured above) is king. While the full size steam or pump driven espresso machines and the stove-top coffee pot all produce espresso, this style of pot is referred to as macchinetta in Italian to distinguish it and the coffee it makes. Ours is a stainless steel Bialetti unit. It has both stainless water and coffee reservoirs and a stainless filter unit. Due to some concern over the use of aluminum coffee pots, we made the switch about two decades ago. Whether the fear is real or imagined, I have seen the corrosion that coffee can be produced on aluminum pots and felt that I probably didn’t need any more base metals in my diet. This is our third unit. Through trial and error we found that constant torquing on the pouring handle while tightening the two main sections together will eventually lead to breakage (I’m not always the sharpest tool in the drawer). Tip #1: Don’t tighten the two pieces using the handle for leverage. It took a while to determine the optimal grind of coffee to get a full flavoured brew. Initially we opted for the “stove-top espresso” grind at the local Starbucks, but found that even with tight packing it always produced a weak espresso. Gradually we changed to a grind somewhere between “filter” and full on “espresso” grind, and stopped packing it very tightly. Since purchasing a burr grinder about eight years ago, we’ve settled on a grind one notch up from espresso (not very scientific I know, but it closely resembles the grind we used to buy). You should be aiming to find a grind that balances body/flavour without being too fine. Tip #2: Find your grind. With the grind figured out, the next step was filling the water reservoir. We used to be very cavalier about the how much water we put in. You should be careful to keep the water level below the steam escape valve that all these units come with. A friend (not me this time) recounts the story of an accidentally submerged steam escape valve exploding off the base with enough force to embed it in the wall of his apartment. Tip #3: Always leave the steam escape valve above the level of the water in the reservoir. We also used to be pretty loose with the water used in the unit, but we found that the chlorine in water treatment and the hardness of the tap water effected the quality of the coffee–particularly when we traveled outside of our home base (which has fairly soft low chlorinated water). Now we use filtered water. It makes a difference, particularly with a high acid coffees like those found in Central America. Tip #4: Use filtered or bottled water when possible. Filling the coffee filter unit is something of an art depending on the grind you’ve settled on. I learned to make coffee from an old Italian who had been making it literally since childhood, and he was always insistent upon packing the coffee firmly but not tightly into the filter. 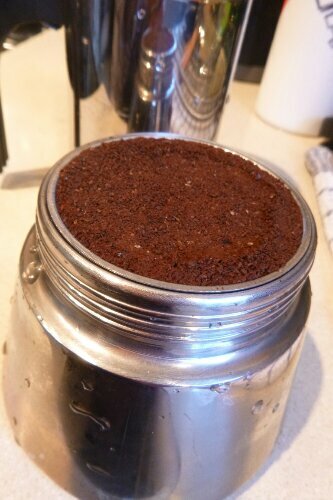 Overpacking the filter with fine ground coffee will cause the coffee to “burn” as the heated water is forced to try and get through the tight plug of coffee–i.e. the water will superheat under pressure and leech bitter alkaloids into your finished brew. I slightly overfill the reservoir and then tamp it level with the rim using light finger pressure. I call it an art because it takes practice to get it right–not tight enough and you can see water left in the coffee filter unit when you open it, too tightly and you’ll see that the coffee has taken on a nasty black colour. Tip #5: Tamp the coffee into the filter keeping it level with the rim of the filter unit. One more thing about filling the filter unit that you’ll notice the minute you do it incorrectly–always make sure the lip of the filter has no grounds stuck to it. It will break the seal between the water and coffee reservoirs and allow steam and water to escape. Tip #6: Always clean the lip of the filter unit. Now that the coffee is in the filter, screw the coffee and water reservoirs together tightly, and start brewing. I always do this at high heat, but if you have time doing it medium high or even medium heat will often produce a richer cup of coffee. Watch the coffee as it slowly fills the reservoir. The time to take it off the heat is when the rich coffee “crema” (the light mocha coloured foam) starts to pour from the inlet pipe in the centre of the reservoir. If you leave it until the steam flows from the inlet valve you will again end up with a poor product as the steam and residual water heat the grounds and leech bitterness into the now finished coffee. Tip #7: Remove the pot from the heat as the crema forms and before the steam begins to escape. If all as gone according to plan you’ve ended up with a rich full bodied espresso ready to tip into your preheated demitasse and enjoy… or like if you’re like us, use it to make “Americano” style coffee (I really hate this made-up term) by adding 2 parts hot water to 1 part espresso–creating basically a heavy-weight, North American style coffee. PS You’ll notice I haven’t made any recommendations about what kind of coffee to use. Ultimately, it’s a matter of personal choice, but we’ve found that most coffee sold for espresso use is generally over roasted. Look at the beans in a true Italian coffee shop and you’ll see they are a blend of lighter and darker roast beans–but never black. Pass on the French Roast or even the Espresso roast found at most retailers and look for a good, full bodied, medium dark roast coffee (dark but not too dark). My preference is for low acid Indonesian coffees (usually grown in volcanic soil), but many people like the high acid Central American beans–let taste be your guide.